The majority of our users are remote database users, or sync users. 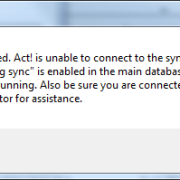 For those that don’t know, a sync user has ACT! installed on their computer, with a remote database and they synchronize changes to and from the main database. For any ACT! user, the fewer clicks to accomplish a task the better. Adding the sync and refresh buttons to the Toolbar eliminate clicking through menus completely, and give you single click access. Now you have Sync and Refresh in simply, easy access buttons. Of course, you can add any buttons you like, to make whatever Tasks you do often even easier. 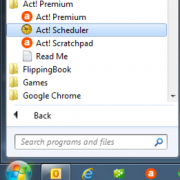 Sage ACT!2011 HotFix 1 Still scheduling in Outlook?